In our school, we are very proud to offer a 52 place Nursery provision within our Early Years Foundation Stage. This provision accommodates 26 children in a morning session and 26 on an afternoon within the class organisation we call Esk Class. Children come into our provision the term following their third birthday. Our Nursery provision works within a unit with the Reception class. This page is designed to provide you with information about our setting, however, please do not hesitate to contact us if you have any further questions. At Staynor Hall Primary Academy we work in partnership with every family to support and enable children to flourish through play in a caring, happy, stimulating and safe environment. The Early Years Foundation Stage Unit is part of the main school building and can be accessed from the main playground through the gate. The Unit is a neutral but stimulating environment which both Nursery and Reception classes share. The children have access to an outdoor area designed specifically for children in the Early Years Unit, this compromises a wide range of outdoor resources which children have access to throughout their session. Admittance to the setting is monitored ensuring the safety of your child. The class teacher for Nursery is Miss Sullivan supported by Mrs Bugg and Mrs Elliott. The Early Years Foundation Stage is led by Mr Card who is the Deputy Headteacher supported by Mrs Carolan, class teacher. The other valued members of our team are Mrs Carlyle, Miss Knowles, Mrs Hudson, Mrs Buttery and Mrs Jones who are our skilled Assistant Teachers for the EYFS Unit. All members of staff regularly attend training courses to further develop their understanding of childcare and to keep up to date with relevant information. At Staynor Hall we recognise the importance of parents involvement in their child’s development, we, therefore, encourage parents to take an active role in their child’s learning. We hold regular parent meetings twice a year, as well as an online learning journey which you will be able to access with your own personal login. Please ensure to check our website frequently as this will also keep you updated with all the latest news and events. We are always available to discuss your child at a convenient time for both yourself and the school. There are two classrooms in the Foundation setting which are open plan and well-resourced with provisions to ensure coverage of The Early Years Foundation Stage. There are also three toilets and sinks which are child size and height to encourage independence. We work closely with parents to support toilet training and general hygiene routines for children. We consider outdoor play to be vital for your child’s health, development and education. We have one outdoor play area combined with Reception children which can be accessed from both rooms. There is a playhouse, a mud kitchen, a sandpit, a large area for construction, a water area and areas to expand children’s mark making outside of the classroom. Children have access to a water tap and can role play in the playhouse. When you ask your child what they did today the usual response is “Only playing”, and this is exactly what they will have been doing! However, there is much more to play than meets the eye. You children will be learning through play and play experiences. The play is natural to children and is the way in which they learn. Through play, they learn new skills, develop new interests, encounter new experiences and build on previous knowledge. 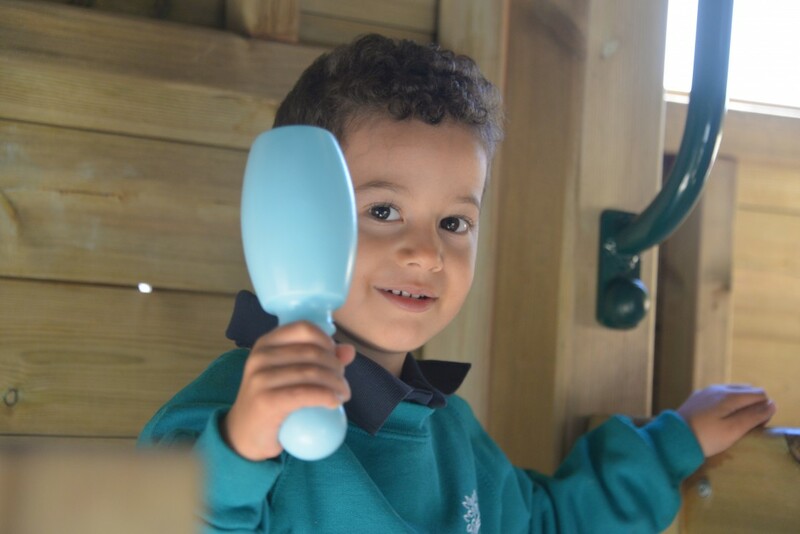 We aim to provide a secure, caring, happy and structured environment where the children learn through meaningful play by using materials and equipment carefully selected and planned for by the staff. All activities will be planned through monitoring and assessing the children‛s individual needs and emerging skills. The children will have the opportunity to take part in a range of activities including; Messy play, Role Play, Singing/Nursery Rhymes, Storytime, Letters and Sounds activities, Small World and Construction activities. Every child, the term after their 3rd birthday is eligible for 15 hours funding. We are unable to offer extended 15 hours funding, however, this can be used for wraparound care. Usual pick up and drop off is situated on the main playground at 8:30 am for drop off and 3:30 pm for pick-up. However, on a Wednesday at 12:30 pm (session B children), the drop-off is from the door labelled at ‘Staff Entrance’ which is located on the right-hand side of the school near the car park. Pick up at 3:30 pm on a Wednesday is the school playground. For those collecting their children on a Wednesday at 11:30 am (session A), the collection is from the playground, as usual, gates at the front of the school will open at 11:30 am to allow access to the playground to collect your child. If you are considering a place and would like to come and visit us, please get in contact to arrange a time. It is a chance for children and their parents to come and get a feel for the setting and to meet the staff and try out some of the exciting equipment and resources. If you would like to register your child for Nursery please contact the school office at admin@sh.ebor.academy. We will get in contact with you the term prior to your child starting Nursery to invite you to a Stay and Play session. Thank you for considering our Nursery at Staynor Hall and we hope to see you soon!